MOSCOW – Nothing will stop Russia from hosting the best World Cup in the tournament’s history in 2018, FIFA president Sepp Blatter said on a visit to one of the host venues Sochi on Monday. “I am a happy and proud president. I am proud that Russia is getting ready to host the World Cup,” Blatter told the TASS news agency from the southern Russian city. Blatter said the 2018 World Cup will be his 10th after more than 40 years working for soccer’s world governing body and he expected the finals to be a “wonderful” event. “Some people are wanting the World Cup to be taken away from Russia, but we will give one answer to this – we are involved in football and we will not allow politics to get in the way,” the 79-year-old Swiss said. 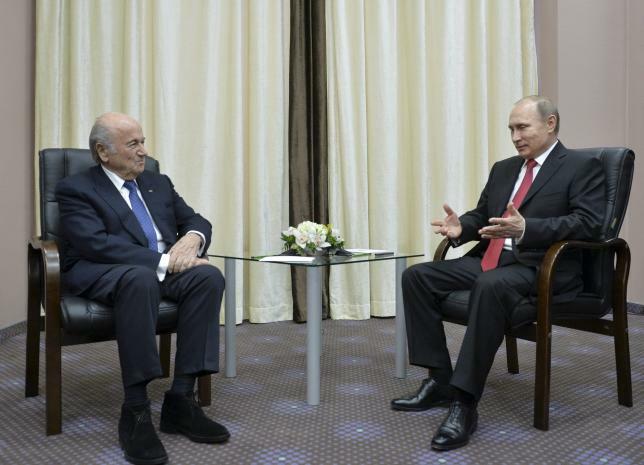 Blatter was set to hold a working visit on Monday with Putin and said he would tell the Russian leader he was pleased with the progress the country was making on the World Cup. “Everything is going to plan and nothing will get in the way of Russia hosting the best ever World Cup. The economic situation is not the best, but I know it will get better. “The main thing is that the people of Russia are organising this tournament. The people want this championship to go ahead and I personally feel this,” added Blatter.